Sri Sri Radha Krishna Temple (ISKCON Temple) in Chennai is a Modern Temple in looks and spirit! Fourteen years back, I remember going to ISKCON Temple in Bangalore for the first time and I was astonished to find shops, bakery, eateries, cinema theater (yes you read that right) inside that Temple!! This Krishna Temple in Chennai is a more recent one, and I thought why not visit and see what they have here. Needless to say, ISKCON Temples are neat and well maintained. There is no entry ticket for the Temple, and I found one donation box near the footwear deposition chamber (where they request an optional donation of Rs. 2). One person was confused whether this Rs. 2 was for one pair of chappals or three pairs of chappals (for his family). Taking advantage of the ambiguity, he decided to pay only Rs. 2 in the end 🙂 There is a huge bike/car parking facility in front of the Temple. Then I went to the Temple on the first floor where they have kept the idols. This is one of the idols kept there. Yes, you can take a photograph of the idol! They however ask us not to take a photo of anything else inside the Temple, including the paintings, etc. but people were clicking everywhere! This is the photo of another group of idols kept there. Have a look at all that woodwork! There is a large hall in front of these idols where one can sit and contemplate on the (non existent) meaning of life. While I was doing that, a Bharatanatyam dance program by some dance school students started! I watched a couple of dance performances and then left because I had to visit a Jain Temple nearby. Yes, the dance was good. This ISKCON (International Society for Krishna Consciousness), popularly known as Hare Krishna movement, was started by Swami Prabhupada. It seems, he came to the US in 1965 on a freight ship (free lift) with equivalent of $8 USD in cash and many books. That’s all he had. And within 12 years, he established hundreds of Temples and developed a devoted following across the world. Don’t you think that’s fascinating? PS: While coming back from this Temple, I visited fellow Blogger Jeevan who blogs at Jeevan’s World, as his home was on my way back. We had a great time and discussed a lot of things, including blogs. Here’s his post on our meet. Photos: By Destination8infinity (Own work) [CC-BY-SA-4.0 (http://creativecommons.org/licenses/by-sa/4.0)], via Wikimedia Commons. Thanks. That photo of the full Temple has surprisingly come well, maybe because of the clouds above! 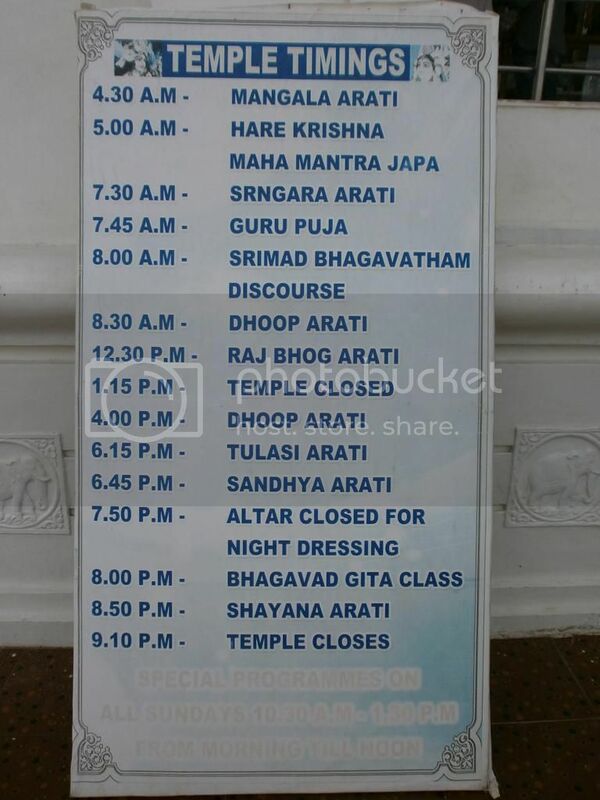 Thanks for sharing the info on ISKCON, Chennai. We have been to the ones in USA and in Bangalore. Taking advantage of our stay in Chennai, we will visit this one also. Can you tell me where this is located in Chennai? This is in ECR – East Coast Road. There is one road called Kalignar Road that goes from Sholinganallur to Kovalam (ECR). On that road, you need to take a left once you reach the ECR, and from there, the Temple is in the second or third (small) left, inside. There will be an arch and a board mentioning ISKCON on the corner of the road. I was just like you when I was younger! But these days, I have come to accept that even man-made things are a form of nature. Man cannot make things. He can only convert one form of nature into another! I had been there a couple of months back and was thinking of writing about it! We can meditate at the centre of the hall in front of the idol on a particular place, it seems. Yes, it was clean everywhere. I had been to Bangalore ISKON too. They sold even pizza, cake etc. That was too much. It was just entertainment place. I like the pooja though. They do it with ‘shraddha’. When I was in Bangalore, I heard that ISKCON group was planning to build a Krishna theme park. Not sure if they went ahead with that project! Lovely snaps. A food joint in a temple is interesting! Different, for sure. Especially, the inclusion of western foods, there! Beautiful captures on the pretty white temple! Nice step architecture and the temple complex seen quiet and neat to walk around. Thanks KPji. Long time – no new stories from your end? Do go. If possible, on Sunday evening. There might be some program like the Classical dance I saw. Such a majestic temple. Beautiful shots. ISKCON temples are always so grand. Have been to the one in Bangalore. Nice pics DI. Yes, the food is yummy. Wish there was a medhu-vada for puliyodhara, though! I remember attending my cousin’s wedding in the Bangalore ISKCON Temple. All these temples have so much peace radiating from them. They are my mom and aunt’s fav temples. Lovely snaps, Rajesh. I have only visited ISKCON in Rajamundry , a lesser known city in Andhra Pradesh. I have not visited the one in Hyderabad yet. There is a Jagannadha Swamy temple in Hyderabad which I have visited and it is a copy of the Puri Jagannadha Swamy temple. There is one copy of Puri Jagannadha Temple in Chennai also. I am planning to visit it shortly – will write about it too. Nice photos. Makes me feel like going there! I had visited Chennai some years ago but did not know there was an Iskon temple there! I have visited the Iskcon temple in Bangalore and it is similar to this one – very neat and clean and beautifully maintained. I should visit the one in Chennai too when I come there next time. Yes, do visit. Preferably on a Sunday evening – some events may be held on that day!